Originality is one hallmark of great art, ad there is little chance the paintings of Howard Post can be mistaken for the art of another artist. Post's images are recognizable through their combination of rich colors, bold compositions, and unexpected perspectives. Thematically, his works are entrenched in Western American imagery with depictions of cowboys, horses, cattle and rodeos tht highlight ranching traditions still found in the contemporary West. Yet his paintings stand apart from those of other Western artists, in part, because of what he does not portray. Missing are the cliches of the Wild West: gunfights, bucking broncos, stampeding cattle. Rather than the rowdy and romanticized stories that frequent the genre, he presents a realistic side of teh West. 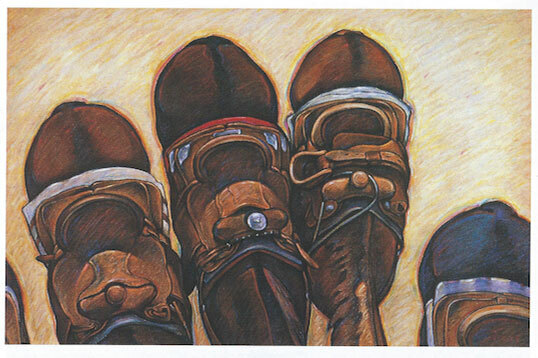 Apart from his strong use of color Post's paintings are predominantly reserved and thoughtful, even when picturing rodeo - a sport known for its high drama. Yet they are also highly imaginative and personal, expresing subjects about which Post is deeply knowledgeable. A third-generation Arizonan, Post was born into a ranching family. His father was a cowboy, and the family owned a small ranch outside of Tucson where they reared rodeo stock. Post grew up riding and roping, activities in which he still takes part. Though reluctant to brag about his accomplishments, "I did my share of calf roping, bull riding and bull-dogging," he admits. Raised among horses and cattle,Post became a skllled rodeo athlete, recognized as Arizona's 1965 high-school All-Around Rodeo Champion. He joined the rodeo team at the University of Arizona whie pursuing a degree in fine arts, followed by two years competing in the Professional Rodeo Cowboys Association circuit. He ropes competitively to this day, but at remains his primary focus. "I don't really think of myself as a cowboy who paints," he says, "but rather as an artist who happens to have been a cowboy." Post considers himself an artist first and foremost, thus his experiences are filtered through this self-identification. Ever aspect of ranching and rodeo is considered artistic fodder - not just the exciting moments that might stand out to those less familiar. The quiet moments, in fact - the many hours that make up a large amount of time involved in ranch and rodeo life - are what he conveys so well. Consider The Resin Bag. Pictured is a cowboy prior to competition who, in a moment of silent contemplation, mental rehearsal and thoughtful preparation, prepares his saddle and gloves with resin to keep the leather from slipping This theme of introspective competitors, away from the action of the sport, is seen in several of Post's works. To focus on athletes apart from moments of competition is relatively rare in art; here, Post's images cut against the grain of the romanticized Western art tradition. Instead of rambunctious rides atop widly thrashing beasts - subjects that hae remained popular in Western imagery since the 19th century - his deisgns only hint at the adrenaline brought on by the anticipaton of the action to come. In their reserve, Post's rodeo compositions recall Thomas Eakins' 19th-century painting, Between Rounds. Today considered one of America's greatest depictions of boxing, Eakins emphasized the period of calm as a fighter rests in his corner before returning to battle his opponent. As with Post's paintings of suspended action, the drama is in the expectation of what will happen. Another association with Post's imagery that might at first blush seem unlikely is the [the work of] Frenchman Edgar Degas, who rarely showed [his ballerinas] on stage. Instead, he primarily depicted the young women in rehearsal, dressing rooms or backstage. Rather than performing, more often than not they are found practicing moves, adjusting gowns, tightening silk bindings of pointe shoes, stretching to stay limber and working out sore muscles. In this manner, Degas' dancers and Post's cowboys share in that moment outside the limelight. As had Eakins and Degas before him, Post explores the potential for realism in his art. This is not to suggest that he attempt to exactly replicate nature – only that he expresses his reaction and interpretation to the world around him. In this regard, his art is aligned with the Realist movement that developed in 19th-century Europe. Realist art is based on observed nature and the material existence of objects, combined with the artist’s personal vision. Similar to earlier realists Post does not convey exactly what he sees, nor does he attempt to mimic nature. Instead, he communicates what he recognizes as true. In the late 1970s, while pursuing his master’s degree in fine art, Post encountered instructors who often suggested he paint what he was feeling. One of his professors at the University of Arizona, however, suggested he focus on what he knew. 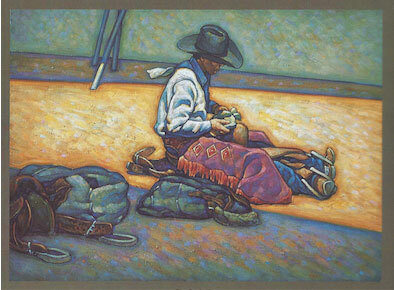 By this time, Post had already worked as an illustrator and art director, and taught painting at U of A. Having worked through a variety of “-isms” in art, all of which left him questioning his own artistic direction, he took to heart the advice to paint what he knew. Rather than build images from a series of studies, Post paints directly on the canvas. Working in his studio, he begins by making quick, dark outlines of major forms, initially attempting to capture an idea without concentrating on details. As a painting progresses and colors are added, he allows the work to take its own course. “in order to show my intimate reactions, I try not to bring any preconceptions to the canvas,” he says. What develops, then, is based on observed nature and represents recognizable subject matter, yet the expression of compositional elements and overall quality of design remain important. Where earlier works often focused on the labyrinthlike qualities of cattle pes, paintings from the past decade tend to be landscape-oriented – what Post calls his “ranchscapes” – containing less-obvious abstraction in the mature work. However, Post still considers his subjects as forms and abstract masses during the painting process. 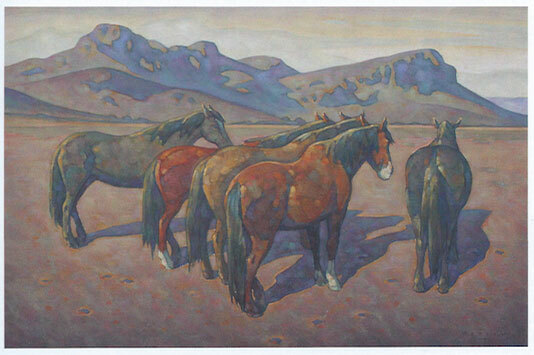 Discussing equine images such as Seventeen or North of Tucson, Post says “They are obviously depicting horses but they are abstract shapes to me.” The desire to free himself from the subject matter comes through most clearly in his handling of paint. His canvases display distinct, painterly qualities that could never be mistaken for anything but stylized depictions of natural objects. In Post’s painting, elements are bathed in warm sunlight, and individual items have an energized presence. Vitality is found on the edges of objects, which display a distinct, shimmering halation, particularly in strong light. With two eyes to create binocular vision, the mind is capable of joining two slightly differing views into one mental picture. The merger is never precise, however. There remains an ever-so-slight blurring at the edges of things, further enhanced because our eyes are rarely perfectly still. An interest in the effects of halation are a preoccupation of Wayne Thiebaud. … Known for his pop-art representations of pastries and sweets under artificial, display-case luminescence, Thiebaud’s paintings were the first to introduce Post to the vibrancy halation creates. In Post’s images, such as Custom Saddles, the outlines of forms pulsate with color. In recent work the effect remains, but is generally muted. The use of daylight is always an important element within Post’s compositions. It is visible in the strong lighting and deep shadows cast in rodeo pictures, as well as in the soft glow of dusk sweeping a landscape. Outdoor scenes are made from rich and warm colors rather than the reality of Arizona’s intense brightness. Post paints ideal times of day, when the rising or setting sun produces heavy shade and colorful effects. The blinding midday sun washes out landscape details and flattens mountain contours, yet at very early or late hours, deep crevices become visible. Post’s mountains appear sculpted by light and dark, which evoke depictions of the Southwest by Maynard Dixon. … Paintings by Dixon and Post include multicolored shadows that suggest their physical presence. Post does not attempt to convey overt political or social statements with his work For stimulus, he instead ponders his immediate surroundings, the land on which he lives. We are all invited to share his experiences and calm outlook on life through his visual creations. Images depict isolation yet lack a sense of loneliness or despair. 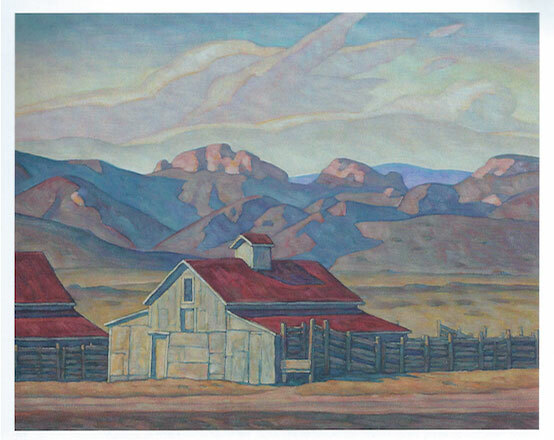 In a canvas such as Two Barns, Post paints emotion into a ranchscape where two modest white barns with red roofs, which may be seen and quickly forgotten by most, through Post’s observations exude the contentment of an unhurried lifestyle. He knows the ideal, unromanticized contemporary American West. As a composition, Two Barns deals with all the issues of abstract forms, geometric forces and painted surfaces for which Post is recognized. On a personal level, it speaks to his experience as a quietly religious family man and successful artist. With grown children now away, Howard and his wife, Marilyn, live peacefully on a small plot of land outside Phoenix, caring for horses and friendly dogs, It is here, in this small corner of the American Southwest, where he continues to draw inspiration. Editor’s Note: Howard Post: Western Perspectives (Rose Frederick Fine Art Publishing, $65) by Jerry N. Smith was released in May 2013. Copies may be purchased online a www.RoseFrederick.com. Jerry N. Smith, Ph.D., is curator of American and Western American Art at Phoenix Art Museum.